Moobs está oficialmente no dicionário! Junto com mais de 1000 novos termos escolhidos a dedo pelo time de linguistas que atualiza o tradicional Oxford English Dictionary. Veja aqui [em inglês] como Oxford escolhe as novas palavras que entram na publicação. 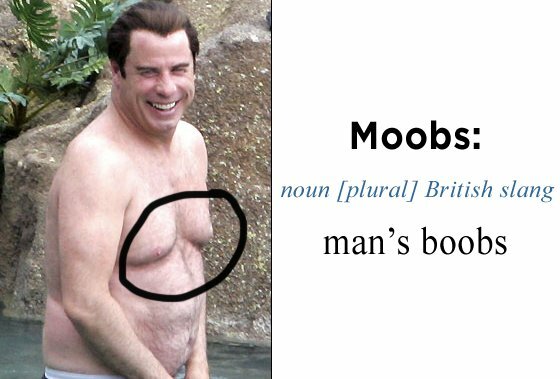 Não é por modismo, elas precisam ter, por exemplo, registro de pelo menos 10 anos de uso (a primeira vez que “moobs” apareceu foi em 2001!). Uptalk: aquela entonação que aparece no final de uma pergunta, sabe? Laugh: express joy by making a sound, moving the face or body. Ex. : That joke was really funny, we all laughed so hard! Chuckle: laugh quietly, almost holding it inside (maybe because you are thinking about something funny). Chortle: give a loud chuckle of pleasure or amusement. Ex. : When I told her what happened, she started to chortle happily. Giggle: laugh quietly and repeatedly because you are nervous or embarrassed. Ex. : The teacher told him off in front of the class and he just giggled nervously. Titter: a short quiet laugh at something embarrassing, not very kind. Ex. : His speech was awful, I even heard someone tittering. Snigger (GB) / Snicker (US): laugh quietly, unkindly at something that is not supposed to be funny. Ex. : When the teacher tripped on the steps, the boys sniggered. Cackle: laugh loudly in a high voice. Ex. : Oh man, when I saw that YouTube video I started cackling and couldn’t stop! Ex. : They guffawed at what the dog had done today. Smile: make one’s mouth curve upwards, like the smiley 🙂 in order to be friendly or because one is happy. Ex. : Don’t be sad, give me a smile! Ex. : The mother looked at her newborn son and beamed proudly. Ex. : When I told her we got the money, she just grinned. Smirk: smile in an unpleasant, smug way, to show superiority or that you are pleased by somebody’s bad luck. Sneer: smile in an unkind way, showing no respect for somebody.